The weak beams of light streaming into my bedroom were a clear giveaway that it was morning already. I got up stiffly, feeling restless and shaky. It hadn‘t been the best night‘s sleep I had ever had. I gave an enormous yawn, as I walked sluggishly to my closet to decide what to wear. I’ll be honest, this was the highlight of most mornings for me. ‘Vain, much?’ says the critical side of me. ‘No,’ replies the inner-child. ‘I just LOVE the clothes in my closet! And the joy of picking out a new outfit to wear each day. Every crisp, clean shirt, and every long, sweeping dress... I had to be extra picky today. Today was a big day. That blissful time of year had come around again, that amazing, exciting time! It was the Annual Usuki Doll Convention, and despite how I had been every year so far, I was a crazy collector of Usuki Dolls, and wouldn’t miss it. This year would be even better than any other year. If that was possible! My Usuki Usul friend, Keizara, adored Usuki dolls just as much as me. 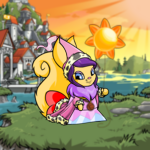 I eagerly had agreed to accompany her to the Convention, where she would be giving a grand speech to the Neopets who gathered in Neopia Central, eagerly crowding around the Toy Shop, to tell them what being an Usuki Usul was like, and signing copies of her book, the Usuki Collectors Guide. I, of course, already had my signed copy; the first one! I was incredibly jealous of Keizara, though. Imagine being a part of all that wonder! Oh, that would just be my dream come true. I flicked through my clothes that were all hung up neatly, all pressed and ready to impress. I picked out a beautiful purple dress made from the finest silk, and found the matching Delicate Wispy Cape to wear (the weather forecast claimed that today would be gloomy, and that it should rain for most of the day). I peered outside, and the prediction was confirmed. Dark clouds were rolling across the sky, in fierce and threatening patterns. I sighed. Then again, at least the convention had its own large and very pretty pink and white striped marquee for such situations. They would be putting it up about now, no doubt. The convention started at 10am NST and it was now 8.30am. Wow, I was up so early. How could I sleep, though?! I had been waiting for the convention to come around again for months! It wasn’t like I was an Usul or anything. I was a Kacheek, but I loved the dolls for their pretty gowns and their long, soft hair (which came with a free brush so you could style it yourself- how clever!). Of course, I’d never take them out of their boxes, let alone fiddle about with their already perfect poses. My favourite out of all my dolls was the Magical Hair Usuki. It reminded me of Keizara so much! I got ready, smoothing out my clothes, and then pulling my long hair into a sleek up-do. I added my Pretty Pointy Hat to my outfit to protect my hair from the drizzling rain. I decided that, seeing as I was up so early, I’d go and help with the preparations for the convention. On my way out of my dear little Neohome on Soup Alley, I grabbed a Pink Doughnut from the tray on the kitchen table, not hungry enough for a full breakfast. I closed the front door behind me as quietly as possible, not wanting to wake the rest of my family. My Neohome was just a few minutes from the Neopian Bazaar, where the Usuki Convention would take place. I skipped along merrily, being careful not to step in any of the large puddles that littered the sidewalk. I turned around to see the outline my best friend, and Usuki collector, Keizara, jogging and waving her arms frantically to get me to slow down. I stopped skipping and grinned at her blurry figure that was approaching me. “Wow. The rain's bad, huh?” she said, getting out her pink swirl umbrella and putting it over both of our heads. “Yeah, it’s terrible. And on the Convention day!” I shook my head disbelievingly. We hurried on in the general direction of the Bazaar. When we arrived, our cotton socks a little damp, we saw that the grand marquee was up as we both predicted, and the Toy Shop owner, a friendly red Lupe, was working hard putting out chairs. The Usuki Land shop owner, a pretty blue Blumaroo, was arranging a grand display of piled-high pink boxes. Wow! All new Usukis! Keizara and I grinned at each other like Christmas had come early, and rushed forward. “Ooh, you two are early!” She beamed. “Of course you can help, dears. Do you want to put these flyers out on the chairs?” She pointed towards a table, with important things on it, like tickets, posters, and the flyers. “Sure.” I beamed. Taking the flyers from the table, I made a bee line for the first row of pink chairs. The red Lupe smiled at me as I passed. Wow. I’d never seen Keizara act so... superior. She was always so kind. Putting others before herself. Now, here she was, letting me wander around like the common peasant as she sat down on her plush throne. I gaped at her, but she acted indifferent. Annoyed, I carried on putting the flyers out of the comfy chairs. I saw that a few of them held ‘Reserved’ signs. Hmmm. I wonder... would I be able to get a reserved seat? Imagine that. Front row! “For the show?” she asked kindly. When I nodded, she waved her hand as if I should go ahead. “Of course, dear, you’re helping, aren’t you?” She smiled once more, and then turned back to her task. So, here I was, waiting for the stupid surprise. The show flowed by easily. The kind Blumaroo and the red Lupe talked about new Usukis, new gowns, and all new playsets (with real functioning swing-set!). I listened intently, taking mental notes now and again of items that stuck out to me. I chatted to the little pink Shoyru, who sat next to me, a little as well. 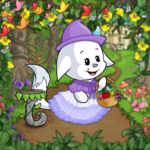 Her name was Fifi, and she only collected Usukis with ball gowns, because she adored princesses. I told her about my collection, all in boxes and all perfect condition. She couldn’t believe it! She said that her baby sister knotted the hair of most of hers. I felt secretly smug. As if Anerzan, my baby Ogrin brother, would ever be allowed near my amazing collection! It was soon time for Keizara’s speech. I listened intently; no matter how haughty she could act, she was still my best friend. She talked about her collection, which I must say, was grander than mine. She also talked about the advantages of being an Usuki Usul, and the disadvantages. She then moved onto the topic of her book. Secretly, I had helped her write some of it. I refused to be credited, though, however much she insisted. It was her book, after all! She deserved the lime light. Now, she talked of the dresses in the book, and how mixing them with different dolls could make a unique and ‘customised’ effect. That had been my idea. I felt proud now, as she spoke about it happily. I was happy she found my idea book-worthy. “Of course, every writer needs a bit of a nudge an inspiration,” she was saying. “I had a lot of highly appreciated help from my best ever friend, Ixvy the White Kacheek! Can you come up here, Ixvy?” She was beaming in my direction. What?! We hadn’t agreed to this! I was grinning inside, though. As she beckoned with an outstretched hand that I should join her, I leapt up happily, and skipped my way onto the stage, to a round of applause. “To show my thanks, Ix, I want to give you these.” She reached to the table behind her, and handed me a magnificent bunch of the most beautiful Summer flowers I had ever seen. “And this!” she added, giving me a pink box, with a cheeky grin on her heart-shaped face. My hand trembled as I reached for it. Inside was the most beautiful Usuki I had ever laid eyes on. She was wearing a long pink gown of the smoothest silk, and her pale blue eyes stared out at me, sparkling in unison with her friendly smile. “Th- thank you!” I stammered to Keizara, pulling her into a big hug with my free arm. It was not the gifts I was most thankful for, however. Nor was it just the credit for the book. It was the clapping crowed, all beaming up at me. It was being stood on this stage at the Annual Usuki Doll Convention! It was finally being a part of it all. "No, you really are great!" Jenny assured her enthusiastically. The Yurble laughed uneasily and glanced at her owner, hoping she could save Ali from the awkward position.